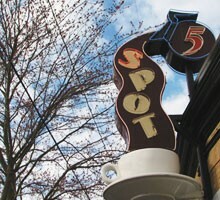 With its ever-changing menu—half of which rotates every three months or so—the 5 Spot focuses on different American regional cuisines. There's also standard diner foodstuff, somewhat on the yuppified side. Happy hour is twice a day, five days a week. Happy Hour Mon-Fri 8-11 am, 3-6 pm, 10 pm-midnight ($3.50 draft, $2.50 pint of pilsner, $3.60 house wine by the glass, $5 well cocktails, $5 bartenders choice, $4-$5 food items).